As many Canadians know on 17 April 2014, Canadian Armed Forces assets were offered to NATO as part of Allied reassurance measures in response to events in Ukraine. On 29 April 2014, the CAF deployed an Air Task Force comprised of six CF-188 Hornets from 425 Tactical Fighter Squadron, based at 3 Wing Bagotville. The initial deployment was accompanied by a CC-150 MRTT Polaris refueling tanker. What may not be known as well is the organizational structure which supports such deployments. This ATF is an integrated force and is comprised of personnel largely from 2 Air Expeditionary Wing (AEW) and 3 Wing both from Bagotville, Quebec. Other contributing RCAF Wings include 4 Wing Cold Lake, 8 Wing Trenton, and 19 Wing Comox. The ATF deployed to Rumania consists of six CF-188 Hornet fighter jets from 425 Tactical Fighter Squadron, a command and control element, which provides tactical-level command support, a mission support element, which provides logistical support including lodging, food services, supply, transportation and construction, electrical and mechanical engineering, an operational support element, which provides operational support to air assets, including force protection, intelligence, aerospace management and maintenance coordination; and an air movements detachment that coordinates the movement of personnel and material in and out of the deployed location. The RCAF currently has a traditional structure based around air wings and squadrons. As resources dwindle, this is changing. The inauguration of Mission Support Squadrons of self-sustaining logistics teams is a step toward more modern concepts. This has included the formation of an Air Expeditionary Wing (AEW). It was first announced on 20 July 2007 that an Air Expeditionary Wing (2 Wing) would be established in Bagotville, Québec. The aim of 2 Wing is to enable rapid and decisive expeditionary capability in Canada, North America or abroad. IOC was achieved 2011. The new AEW is composed of a Command Element, an Operations Support Flight, and a Mission Support Flight. It trains together and deploys as a self-contained unit from CFB Bagotville in Quebec, with aircraft and personnel tailored to the specific requirements of an operation. If fully staffed and properly supported the expeditionary wing requires a total of up to 550 personnel with associated investments in infrastructure and equipment estimated at up to $300 million up to 2015. It is the aim of the RCAF reorganized its assets in such a way that it can activate, operate and support two deployed operating bases, in Canada or abroad and in austere conditions in order to carry out a multitude of mission types. The need to more efficiently manage resources is nowhere more obvious then with the CF-18 Hornet fleet. Out of an original purchase of 128 CF-18 aircraft, the last being delivered some 28 years ago some 77 extensively modified CF-18 Hornets remain. Seven front line squadrons have been reduced and amalgamated to form just two front line squadrons. 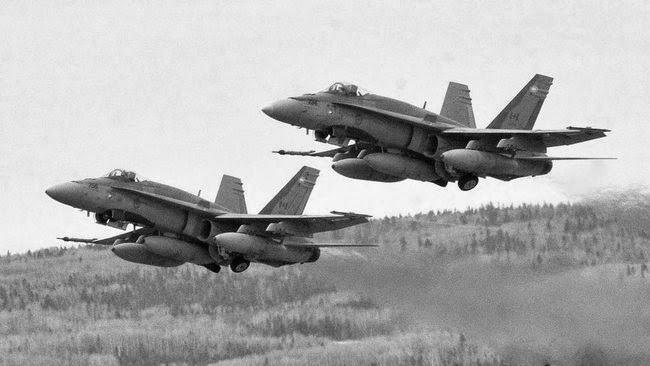 409 Tactical Fighter Squadron (TFS) ‘Nighthawks’ based at 4 Wing Cold Lake, Alberta and 425 TFS ‘Alouette’ at 3 Wing Bagotville, The squadrons each have approximately 320 personal, including 28 pilots, and 25 CF-18s that fly a total of 5,000 to 5,500 hours a year. There is also an Operational Training Squadron, located at 4 Wing Cold Lake, 419 ‘Cougar’ Tactical Fighter (Operational Training) Squadron. 419 “Cougar” TF (OT) S maintains a fleet of 11 two seat and seven single seat CF-18s along with appropriate squadron personal including 18 instructor pilots. Canadian Defence Matters has argued in the past that it is organization not aircraft that are the most important factor in supplying Air Power. Having said that, it is also true that no matter how many slices the pie is divided into, it will not change the size of the pie. No matter how efficient the Canadian Forces become at using available resources, nothing can make up for a lack of those resources. It is perhaps telling that there is another unit belonging to 3 Wing, No.414 Squadron , that has no aircraft. It is composed of military Electronic Warfare Officers who fulfill the combat support role, flying on civilian contracted aircraft, in this case Dassault/Dornier Alpha Jets provided by Top Aces Consulting. The RCAF is to be commended for its attempts to organize for growing responsibilities in an era of declining assets. However, no matter how well organized, an Air Force without aircraft can not “rapidly respond to different types of emergencies, natural disasters, or operations across the spectrum of conflict, at home and abroad.” As aircraft and their maintenance become more expensive, having fewer of them is justified by the increased abilities of the individual aircraft. At some juncture, and we may already be past that stage, a point of diminishing returns will be reached and in the end it will be understood that less just means less.